This year we have been lucky enough to be DUPLO bloggers and have loved every package we’ve been sent, but this one is especially fantastic. 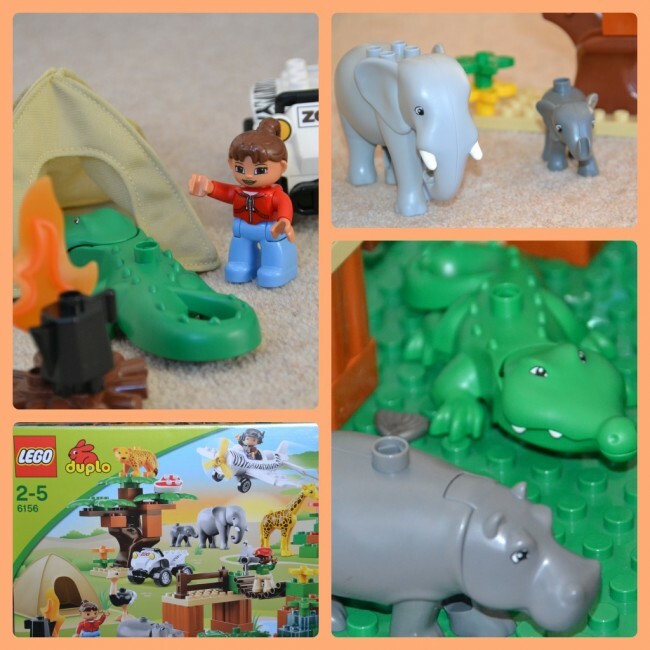 DUPLO Photo Safari comes with 8 animals, 3 people, an aeroplane, tent, car, bridge, tree, campfire and accessories. Little H loves animals, so for her this is the perfect box of DUPLO, it has already led to so much imaginative play from all three children. My daughters still can’t really follow instructions yet, but luckily big brother was on hand to build it for them. I liked that there are several variations to what you can build. We’ve had the crocodile invading the tent and eating the people, the baby elephant riding on the Mummy and the plane has even been crash landing in the bath! As with all DUPLO, the set is excellent quality and I know we will get years of play from it. This set has an RRP of £49.99, which I think is quite reasonable when you consider the number of animals and bits and pieces you get. My little boy is 5 and still plays with both DUPLO and LEGO together and I am sure that all the years playing with DUPLO have been fantastic for improving his fine motor skills, logic and patience. I have loved watching his imagination grow and I’m sure DUPLO has helped with this too. He can often be found using the bricks to make aeroplanes, space ships and animals. Even though Z is now very competent with LEGO he still loves to play with DUPLO as well. It really is a very long lasting toy. I also used DUPLO recently as scaffolding for a Gingerbread house. The possibilities really are endless! We were sent the Photo Safari set for the purpose of this review.